ShoutOUT® is based in Largo, Florida. A “grassroots” organization, created to support local businesses and events, while building relationships, keeping our economy strong and strengthening our community. ShoutOUT provides targeted opportunities to increase connections for small businesses and events in the community. Connect with your community on ShoutOUT Facebook, Twitter, and Pinterest and post your ShoutOUT! Simply stated, we provide a social media forum for you to post “ShoutOUTs” for independently- and privately-owned businesses, local events, fundraisers, and people behind-the-scenes. We’re trying to build awareness for businesses right here in our area that people might not know about, while encouraging cross-promotions and community involvement. We also give “ShoutOUTs” to people in the community that deserve a bit of recognition for the hard work they do, the support they give, and the honors they might receive from others. Heather J. Sell is President and Founder of ShoutOUT® Enterprises, Inc. (http://shoutoutinc.blogspot.com), a “grassroots” organization connecting independent businesses and events to their communities. Heather earned her MBA in Organizational Psychology and Development at Chicago’s American Intercontinental University. In 2011, she won LocalShops1.com BizBlast $3,000 Marketing Competition and Startup Nation.com Leading Moms in Business awards. She resides in Largo, Fla. and frequently participates in community-based events promoting independent retailers, animal rescue groups and breast cancer awareness. She works full-time in IT Security at a national bank, while maintaining the ShoutOUT communities in her spare time and on her own dime. ShoutOUT Connects, Event Calendar, Free Member Directory (community & businesses), Inexpensive Advertising, Community Partnerships, Resources, OPPOR-Tuesdays (Job Opportunities job seekers/employers),Blogging opportunities, and more. 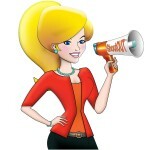 You can reach Heather via email at contact@shoutoutinc.com. This entry was posted in Blog and tagged community, event organizers, events, owners, small business, things to do, what is shoutout. Bookmark the permalink.